Nothing fancy but everything is clean and comfortable. There is a microwave and small refrigerator. A perfect spot to stay that is close to the airport. There is a shuttle service that leaves every hour so you are covered. Hotels around the Phoenix airport are outrageous in price. This hotel is convenient to the airport and provide free transportation to the airport. While it is not the Ritz, it was comfortable and clean. The staff at the hotel do their level best to help you and are friendly and courteous. It is half what you would pay at other hotels and we would definitely stay there again. We paid one price for ne night, which included a limited breakfast, great shuttle to the airport and free parking for the week. 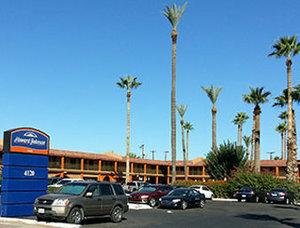 The hotel is old, but the rooms are clean, the staff is friendly and it is do convenient to the airport. This is an older hotel, but clean. It was well worth the money to spend the night, leave our car for free for 12 nights and take the shuttle to the airport. Getting the shuttle from the airport was also very easy. I would recommend this package to everyone. I want to give an exceptional rating for the Room Service Staff from our recent stay at the Howard Johnson Downtown. I forgot a personal items bag in the room and left for vacation for over a week , I called the Hotel and the Service Staff had gotten the bag and it was put aside for me to pick up 6 days later. I am so very glad and very appreciative for the honesty of the staff at this Hotel. If I could suggest one improvement it would be to not place persons in a room where the smoke is very strong. None of us are smokers and there was a definite smoke smell to the room. I am not sure what can be done but that would be one improvement that would be very much appreciated. Thank you, again, to the honesty of the Service Staff at this Hotel. I have stayed at other Hotels and forgotten items and they were not returned. I really appreciated the honesty. When we checked in we were given a room with one king bed. I had wanted a room with two queen beds and was told by the guy at the front desk that it would be an additional charge. So we took the one king bed. When we got to our room it hadn't been cleaned yet so we waited for over an hour to get into our room. Then we had no towels or wash clothes, we had to wait for them to finish being cleaned. While we were waiting in the lobby for our room to be cleaned two other people came in and were treated very bad by the guy at the front desk. He was very rude to both of these gentlemen. I will never stay at this place again. Very unhappy with this whole experience. We weren't quite sure what to expect after reading some of the other reviews but we had a great experience. The manager, who checked us in, was most helpful and friendly. We were given a large room on the ground floor near the front which was great since we had a lot of luggage. The breakfast area opened up at 4:00 am so we were able to get something to eat before our 5:15 shuttle which was right on time. The hotel was old, but you could see that they had been updating. Overall our experience was good and we would stay here again. It was a good value.